You are one of the more serious people you know, for your career and your image are very important to you. 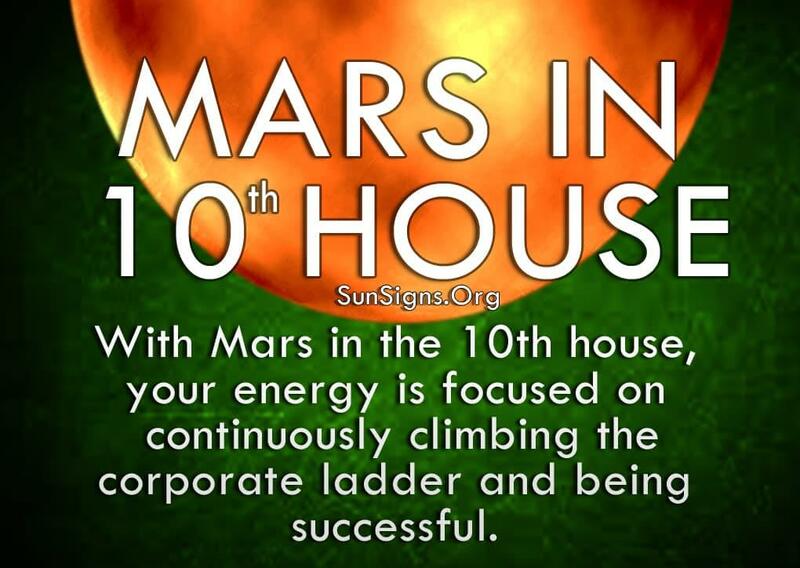 You work hard to advance your career, and with Mars in the 10th house, your energy is focused on continuously climbing the corporate ladder. Success is what drives you. While you are very good at your job, you tend to have trouble working in a group unless you’re the leader. You don’t want to be anywhere else, unless you’re starting a new job and understand you have to work your way to the top. Even then you’re so focused on getting ahead it’s difficult for you to work with others. You always feel you know best for you are extremely meticulous in figuring out a plan. You take your time and slowly but surely move things forward until the project is done to perfection. (Click here to read about Mars symbolism). Those who get to know the Mars in tenth house person, along with your family, will recognize that your ambition is the thing that rewards you the most. And you use it for everything, including in your personal life. You tend to live a lifestyle that reflects your success, and you have a comfortable nest egg that you want to share with someone. Read more articles on your ruling zodiac sign Capricorn. Starting a family is very important to you, which is why you put so much energy into your career from the very beginning. You want to create a stable home environment for yourself and your loved ones. This is also why you tend to put off getting into a relationship until you are financially solvent enough to support other people. You take your personal life as serious as your work life, and you demand loyalty above all else. You’re looking for a serious commitment and rarely get involved in flings, and you offer that kind of dedication in return. While you may not be silly or spontaneous, you are responsible and reliable and protect your loved ones at any cost. The Mars in 10th house astrology predicts that when others try to get in your way, or even suggest a slight change, you ignore them and continue down your path. While the bosses recognize you as someone who gets the job done right the first time, your co-workers might only see a cold, calculating colleague. While your people skills are not always the best, you are never false in your actions or intentions. It just takes time for people to see underneath the hardened exterior to find the kind and caring person you are. And it’s not as though you have no sense of humor. The dry, sarcastic wit of the Mars in 10th house person attracts the kind of people who share in what makes you laugh, bringing you closer together. And you enjoy tough competition and recreational sports, which keeps you active and healthy. Those closest to you know you are honest, sincere and always willing to pitch in when someone is in need. Your organizational skills and ability to get things done make you the first person others come to for help and guidance. You are not willing to compromise your beliefs or ideals, so people always know where they stand with you. And your ability to plan for the future means you are ready for almost anything that comes your way. When things turn chaotic, people turn to you. And you know just how to turn things around to your advantage. Are Abs Made In The Kitchen Or The Gym?